Friday's Featured Fluff Addict is Lori, The Gnomes Mom! Featured Fluff Addicts is another reason why I just love Fridays! Today we're super excited to introduce you to Lori, a fellow blogger, and the mama behind The Gnomes Mom! Read all about her in our interview below. Hi! I'm Lori. I've been married to Jason for almost 2 years. He's a total sports addict who can wash and stuff diapers with the best of them! He's not afraid of a snappi either! He also works really hard so that I can stay home with our son. Our son is 11 months old and we call him "The Gnome." We have 4 crazy dogs - a Boxer named Aggie, a German Shepherd named Tucker, and 2 Chihuahuas named Chico and Kiwi. We live just south of Fort Worth, Texas. Do you have or have you had children in cloth diapers? Yes! When I was pregnant we did a ton of research and finally made our decision on which cloth diapers to choose. We went with a OS diaper and got them all prepped and ready in the nursery so that we could start The Gnome in cloth as soon as we got home from the hospital. Unfortunately, when we came home from the hospital he only weighed 4lbs, 15oz so a OS diaper wasn't an option. Once The Gnome got up to 8 pounds we started him in cloth and haven't looked back since! Were you cloth diapered as a child? No and my mom and mother-in-law both told us we were crazy for choosing cloth. My mom bet me $100 we wouldn't stick with it. Guess I should call her and collect! Originally, it was the savings. Once we decided that I was going to stay home, we knew we would be cutting our income in half. Disposable diapers are expensive! Neither of us counted on me becoming such a fanatic. Even with the huge stash that I've accumulated, we're still saving a ton of money. They're adorable! A close second is the community though. In addition to the online community, I belong to a local cloth diaper group. We have over 740 members and we have monthly meet-ups to talk fluff and let the kids play. Most of my friends think it's cool and I've converted a few of them. Our family thinks that we're nuts! A few days ago I got into the car after grocery shopping and I was wearing shorts. I have leather seats and it was 102 degrees outside. Apparently my seat had been in direct sunlight because it was so hot that I couldn't sit down. I looked around for something to put down but I had nothing in the car. I did have 2 Flip inserts in my diaper bag though, one for each leg! A travel wet bag. We don't use a lot of accessories (confession: diaper sprayers scare me) but a travel wet bag is a must-have! The Knickernappies One Size diaper in Spring Green. 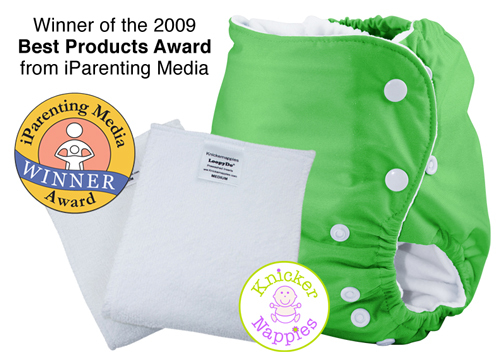 I've heard amazing feedback about them and the LoopyDo inserts from my cloth diaper group! Big thanks to Lori for sharing her story and advice with us! Make sure to follow her blog so that you can stay connected with her. Where and how do you fold your cloth diapers? Tips for Troubleshooting Pocket Diaper Leaks! Facebook Pages, The NEW Customer Support Center? Friday's Featured Fluff Addict is Carrie!